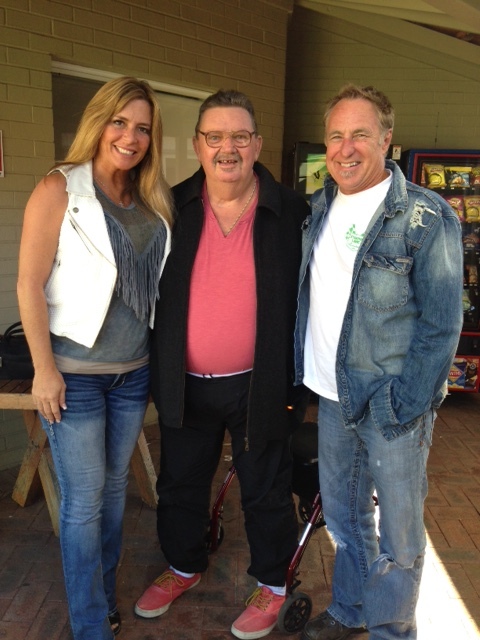 Regis aged care facility in Embleton welcomes TV American Restoration stars. Regis Embleton resident Steve Ruthven was left speechless when TV stars Rick and Kelly Dale from the hit TV show “American Restoration”, paid him a surprise visit. Steve is a huge fan of the show and had previously written to the couple hoping for some merchandise or memorabilia. Rick and Kelly were visiting Australia to attend the Dream Big expo in Perth, Western Australia when they decided to visit our aged care facility in Embleton. The TV stars hand delivered an American Restoration t-shirt to an effervescent Steve. Rick and Kelly spent over an hour chatting with Steve and other Regis residents about restoration projects and their work in America. Steve was overjoyed at the gesture and now has an open invitation to stay with the Dales should he ever make it to Las Vegas, USA. Our Regis aged care facilities always strive to enhance the lives of our residents by providing amble opportunities to interact in the wider community and with various technologies. Find out more about Regis facilities in Western Australia.